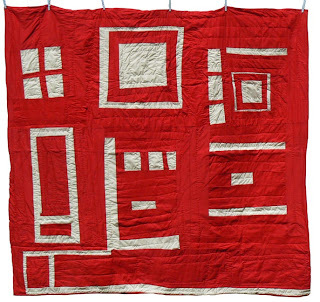 An abstract version of the “house” quilt pattern, circa 1950s or ’60s. This quilt and others can be found at Folk Artisans. Really, the yard signs tell the story. “Don’t expect to see that sign still standing when you come home tonight, boy!” the father said. The young man only shrugged, and left his father standing in the drive way. In the past few years the man had turned old, strong still, but now old. His beard and head were filled with gray, and he spent many warm autumn afternoons sitting in a plastic lawn chair watching the traffic head home. He’d raise one hand in recognition of a neighbor’s car, while the other rested on his belly, balanced between his thighs, suspenders slung over broad bare shoulders. When I first moved onto H Street, the father mowed his postage stamp yard shirtless, sitting atop one of those riding lawn mowers. When he was done, he’d climb into his semi-truck and ease it around the block while checking out the neighbors’ yards. But as his shoulders stooped and his son’s broadened, the boy took over the lawn care, and the neighborhood inspections came less frequently. His McCain signs were the first to go up on the street, divided — almost house by house — over the country’s political future. The neighborhood has been written up in the International Herald Tribune. The city’s been spotlighted on National Public Radio. Pundits say that who wins the county, wins the country. And while he could wave and smile to the Obama supporter, his son’s homemade sign — now dominating the yard — mocked him. “It’s been World War III around here,” his wife told me one evening as we chatted in the street. Fists banged the table. Accusations flew. Someone threatened to put an Obama sign in the yard as well. The young man stomped off to work. The old man stomped off to get another McCain sign. And that evening and the many since, the sun’s orange rays glowed on both plywood and plastic. at the end of the first paragraph I was thinking …Max is for Nader…What? Ha!